The top dogs in my family are my Italian Greyhounds. Though classified as a toy breed, at around 14 lbs with a tall, lean body, they resemble their cousins the full-sized greyhounds, more than any other toy breeds. They are a very active small dog that really needs a family with no small children and at least two pets to thrive. They are easily bored and have difficulty during potty training. They are extremely affectionate by nature and very dedicated to their immediate family. They are odorless and are a great pet because they do not shed. Their bark is deceptively large for such a small dog and this makes them an excellent watchdog. The breed is relatively uncommon, because litters are very small, usually consisting of between 2-4 puppies. actually bred up (made larger) from this breed versus being bred down to a toy size. Italian Greyhounds are extremely healthy and a naturally active breed. One major concern with younger pups is broken limbs. In the early stages of life, the Italian Greyhound doesn't realize that it can’t fly and will often try to make enormous leaps. It is very important to watch them closely until they are at least a year old. Another known health issue is epilepsy. It is a fairly common issue in Italian Greyhounds, but rarely affects their life expectancy. With one of the longest life expectancies of any breed, the Italian Greyhound usually lives between 15-20 years, but some have been known to live to 20 or more. The best thing about having an Italian Greyhound is the level of dedication. They are totally and completely dedicated to their owner and if you're considering an Italian Greyhound, you must be completely and totally dedicated to them. 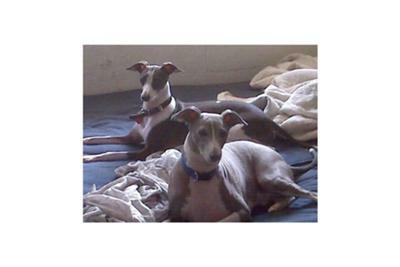 There are many Italian Greyhounds desperately seeking homes through the IG Rescues with many owners citing potty training as the main reason why they gave their pets up. You must be very patient and consistent with Italian Greyhounds. Since they have really short hair, most people find it easier to litter box, or paper train their dogs instead of trying to teach them to go out in the cold. They are a very temperature sensitive dog and really dislike cold weather. Comments for The Italian Greyhound. Are you really in Eugene OR? I desperately need a vet here that understands IGs. Can you help me? If so, please email me. Debra, we have removed your email address in the interest of your privacy, but will pass it along to Tammy if she sees your message and gets in touch with us through this page of our website. Unfortunately, we do not have Tammy's email address. Good luck in finding what you need for your pet.